"Goodbye Yellow Brick Road" is a ballad performed by musician Elton John. 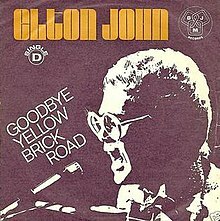 Lyrics for the song were written by Bernie Taupin, and the music was composed by John for his seventh studio album, Goodbye Yellow Brick Road. Its musical style and production was heavily influenced by 1970s soft rock. It was widely praised by critics, and some critics have named it John's best song. "Saturday Night's Alright for Fighting"
(1973) "Goodbye Yellow Brick Road"
The song was released in 1973 as the album's second single and entered the Top Ten in both the United Kingdom and the United States. It was one of John's biggest hits, and surpassed the previous single, "Saturday Night's Alright for Fighting", in sales and popularity quickly following its release. In the US, it was certified Gold on 4 January 1974 and Platinum on 13 September 1995 by the RIAA. The Yellow Brick Road is an image taken from the 1939 film adaptation of Lyman Frank Baum's The Wizard of Oz. In that film, Dorothy and her three misfit friends are instructed to follow the yellow brick road in search of the Wizard of Oz, only to find that they had what they were looking for all along. The road leads to the Emerald City in the land of Oz, often referred to as a metaphor for "The road that leads to life's fantasies" or "The road that leads to life's answers." The lyrics describe wanting to go back to a simpler existence after living what the narrator thought was a good life but realizing he has simply been treated like a pet by his rich socialite lover. The Wizard of Oz was reportedly the first film that Elton John's songwriting partner Bernie Taupin had ever seen, and he used the imagery in the lyrics relating to his own life as his desire to "get back to [his] roots." "Goodbye Yellow Brick Road" received generally positive response from music critics. Janis Schacht of Circus describes it as "delicate and beautiful". Allmusic writes that the song is "a vocal triumph" and a "pinnacle of its style". In 2010, Rolling Stone magazine ranked it No. 380 in their list of the 500 Greatest Songs of All Time. In Canada, the single reached No. 1 on the RPM 100 national singles chart on 22 December 1973 and held the position for one week, making it John's third No. 1 in the year 1973 in that country (following "Crocodile Rock" and "Daniel"). On the US Hot 100, it went to No. 2, behind both Top of the World by The Carpenters and The Most Beautiful Girl by Charlie Rich. On the US Easy Listening chart, it rose to No. 7 and spent 18 weeks on the charts. In Ireland, it reached No. 4; in the UK it peaked at No. 6. The song's flip side is a song called "Screw You", though the US release re-titled the song "Young Man's Blues" so as not to offend American record buyers. John's One Night Only: The Greatest Hits Live at Madison Square Garden had this song done as a duet with Billy Joel. "Goodbye Yellow Brick Road" is still regularly included in John's live performances, although since 1997 he has transposed the key of the song downward (from F major to E-flat major) due to no longer being able to sing its high falsetto chorus. On 12 November 2010, he performed the song live at the Modern Art Museum in Fort Worth, Texas. John named his farewell tour after the song, naming it "Farewell Yellow Brick Road." The song is featured in Stephen King's 1981 novel Roadwork. The song was performed by Camile Velasco on the third season of American Idol for the Elton John theme night; she was eliminated after her performance. The band Keane (with Faultline) covered the song for the Help: A Day in the Life compilation around 2005. Australian artist Sarah Blasko recorded an acoustic version of the song, which can be found on Triple J's 2006 Like a Version (vol. #2). Rapper RZA stated that he listened to the song "at least ten times a day" while making the film The Man with the Iron Fists. On rapper Raekwon's 2009 album Only Built 4 Cuban Linx... Pt. II, RZA, a close friend of John's, sampled the song on the track "Kiss the Ring". John has allowed few other instances of sampling of his music. On 13 November 2010, Matt Cardle sang "Goodbye Yellow Brick Road" on Elton John night of Series 7 of The X Factor in the UK. There is a Dream Theater version of this song, yet it has not been officially released. Casey Crescenzo of The Dear Hunter released a cover version of the song. Sara Bareilles often covers the song live and released a piano & solo voice, the down-tempo version on Brave Enough: Live at the Variety Playhouse as the concert-ending track. The song was featured in David O. Russell's film American Hustle and the film's soundtrack. It also features in the 1990s British television series "Our Friends in the North" and Thomas Vinterberg's 2016 film "The Commune". Additionally, it is featured in Lars Von Trier's film "Breaking the Waves". The song was used in a wordless montage sequence in the fifth season finale of The Americans. Progressive rock band Transatlantic covered this song on their 2014 album Kaleidoscope, on disc 2 of the special edition. An instrumental version of the song as featured on an episode of Japanese variety show AKBingo!, during comments about "heart-warming" story from Ali Takajo's grandfather. Country singer Hunter Hayes covered the song for the 40th Anniversary deluxe edition of Goodbye Yellow Brick Road. In July 2008, Ben & Jerry's created a limited-batch ice cream flavor, Goodbye Yellow Brickle Road, in honor of an Elton John performance in Vermont. Sales proceeds were donated to the Elton John AIDS Foundation. Rock band Queens of the Stone Age covered the song for the 2018 tribute album Revamp: Reimagining the Songs of Elton John & Bernie Taupin. John announced his farewell tour “Farewell Yellow Brick Road” in 2018 with a title that plays off this song. ^ a b Mason, Stewart. "Goodbye Yellow Brick Road". Allmusic. Retrieved 11 June 2006. ^ "Gold & Platinum - RIAA". RIAA. Retrieved 18 August 2018. ^ "Elton John - Goodbye Yellow Brick Road". Superseventies.com. Retrieved 8 October 2016. ^ "Rolling Stone Magazine's Top 500 Songs Page 4". MetroLyrics. Retrieved 8 October 2016. ^ "Item Display - RPM - Library and Archives Canada". Collectionscanada.gc.ca. Retrieved 8 October 2016. ^ "Elton John Goodbye Yellow Brick Road Chart History". Billboard. Retrieved 30 January 2018. ^ Roberts, David (2006). British Hit Singles & Albums (19th ed.). London: Guinness World Records Limited. pp. 284/6. ISBN 1-904994-10-5. ^ "A Q&A With Elton John". Billboard. Retrieved 30 January 2018. ^ "Australian Chart Book". Austchartbook.com.au. Archived from the original on 5 March 2016. Retrieved 8 October 2016. ^ Steffen Hung. "Elton John - Goodbye Yellow Brick Road". Swisscharts.com. Retrieved 8 October 2016. ^ "Dutchcharts.nl – Elton John – Goodbye Yellow Brick Road" (in Dutch). Single Top 100. ^ "flavour of new zealand - search listener". Flavourofnz.co.nz. Retrieved 8 October 2016. ^ "Norwegiancharts.com – Elton John – Goodbye Yellow Brick Road". VG-lista. ^ ""Goodbye Yellow Brick Road" on the South African Singles Chart". Springbok Radio. Retrieved 25 September 2010. ^ "Elton John: Artist Chart History". Official Charts Company. ^ "Elton John Chart History (Hot 100)". Billboard. ^ "Elton John Chart History (Adult Contemporary)". Billboard. ^ "Image : RPM Weekly - Library and Archives Canada". Bac-lac.gc.ca. Retrieved 8 October 2016. ^ Steffen Hung. "Forum - Top 100 End of Year AMR Charts - 1980s (ARIA Charts: Special Occasion Charts)". Australian-charts.com. Archived from the original on 6 October 2014. Retrieved 8 October 2016. ^ "Top 100 Hits of 1974/Top 100 Songs of 1974". Musicoutfitters.com. Retrieved 8 October 2016. ^ "Video News". CNN.com. Retrieved 8 October 2016. ^ "Dream Theater - International Fan Clubs Christmas CD 1998 - Once In A Livetime Outtakes (CD)". Discogs.com. Retrieved 8 October 2016. ^ Sepinwall, Alan (31 May 2017). "'The Americans' Ends Its Penultimate Season On An Anti-Climactic Note". Uproxx.com. Retrieved 5 June 2017. ^ Mansfield, Brian. "Fall Out Boy, Hunter Hayes cover Elton John for reissue". USA Today. Retrieved 8 October 2014. ^ Curran, John (16 July 2008). "Ben & Jerry's makes 'Goodbye Yellow Brickle Road'". Usatoday.com. Retrieved 8 October 2016. ^ "'Farewell Yellow Brick Road' tour announced - Elton John". Elton John. Retrieved 19 February 2018. "BBC: The Official UK Charts Company". United Kingdom sales chart. Retrieved 11 June 2006. "Billboard". Billboard Hot 100 airplay and sales charts. Retrieved 11 June 2006.